Following the incredible success of their 30th Anniversary ‘Steeltown’ Tour, Big Country now celebrate the 30th Anniversary of the album that followed that release – ‘The Seer’. The album itself reached Number 2 in the UK and the single from it ‘Look Away’ was the group’s biggest UK single, reaching Number 7 in the charts. At their gig at The Apex on 14 December, Big Country will perform ‘The Seer’ in its entirety, as well as hits and live favourites such as 'Fields of Fire', 'In A Big Country' (which sold 2 million copies), 'Wonderland', 'Look Away' & 'East of Eden'. Big Country was formed in 1981 by guitar playing founder members Stuart Adamson and Bruce Watson, driven by a shared vision of widescreen guitar melody, harmony and lyric. The band broke massively in 1983 with their debut album ‘The Crossing’ and singles ‘Fields Of Fire’, ‘Chance’ and signature song ‘In A Big Country’, which sold over 2 million copies and earned ‘The Crossing’ three Grammy nominations. The run of success continued throughout the 1980′s with the release of the anthemic single ‘Wonderland’ and the second album ‘Steeltown’ (1984), which debuted at Number 1 in the UK and contained the hit singles ‘East Of Eden, ‘Just a Shadow’ and ‘Where The Rose Is Sown’. In 1985, Big Country appeared at Live Aid in London and in 1998 they were again invited to open for the Rolling Stones tour of Europe, prompting Mick Jagger to say that Big Country were “one of the best opening bands we ever had”. After Stuart Adamson’s death in 2001, the remaining members had no real thoughts of performing as Big Country again, but they were lured out to celebrate the band’s 25th anniversary in 2007. Bruce Watson (guitars/vocals), Mark Brzezicki (drums, vocals), Jamie Watson (guitars/vocals) will be augmented by bassist Scott Whitley and singer Simon Hough. “Hough was a revelation and a more charismatic vocalist is hard to visualise. He had the crowd in the palm of his hand from start to finish” (Ian Russell, Daily Record). Big Country are at The Apex on Wednesday 14 December at 8pm. 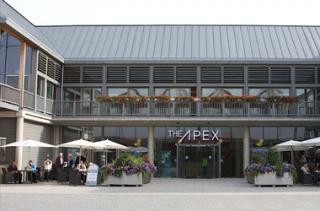 Tickets are £22 in advance, ring the box office on 01284 758000 or see the website - www.theapex.co.uk for details.